I was nervous heading into today’s game, and afraid of a possible sweep at the hands of the team with the worst record in the majors. I could sum up the entire day with this linescore, but I’ll explain the rest of the day as well. Victoria joined me for the game again, and we met in Johnson Creek at 11:00 am. We made our way to Miller Park and pulled into the Cooooooper lot at 11:43. I got the 2,500 “business” cards printed and received them in the mail last week, and I’ve started handing them out. I figure the best time to do it is before the game, and while people are tailgating. I’ll be giving some out during the game and afterwards, but not many. I’m too focused on the game and I don’t want it to be a distraction, either for myself or other fans. It’s really hit or miss with people, but that is to be expected. I start by asking if they’ve heard of the guy going to all 162 games, and then say “that’s me!”, or something along those lines. Some people seem completely disinterested, and don’t even ask a single question, and it makes it really awkward. The last group (of 6 to 8 people) I talked to had heard about me, and were genuinely excited to meet me. I told them a little about myself, and how they could help out, and I think a few of them are going to be joining the registry. We saw them on our way back to the car after the game, and they told me they loved what I was doing, and told Victoria that “he is very personable!” It felt great to see in person someone else’s reaction to what I’m doing. Before heading into the stadium I stopped to take a picture of the statue that faces the home plate entrance. The three individuals pictured below lost their lives on July 14, 1999, when a crane holding one of the roof sections collapsed. It was a horrible accident and resulted in a lawsuit that paid out $95 million. 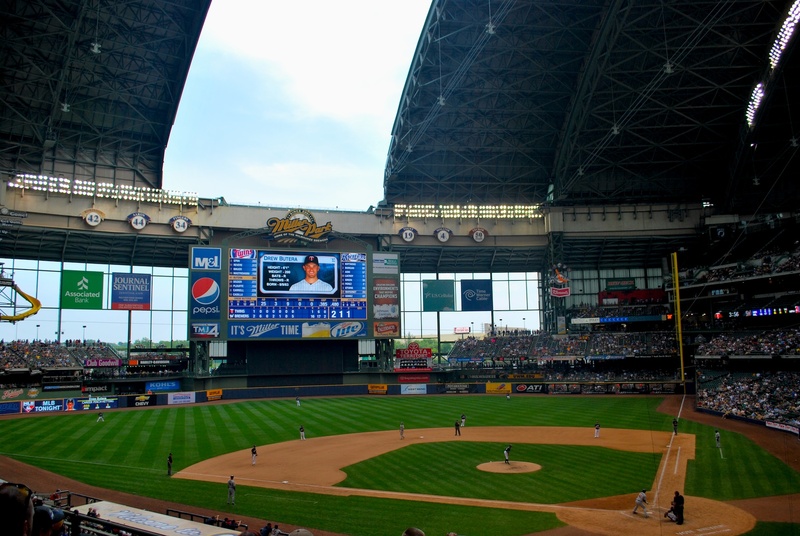 The accident delayed the opening of Miller Park until 2001 (it was originally scheduled to open in 2000). 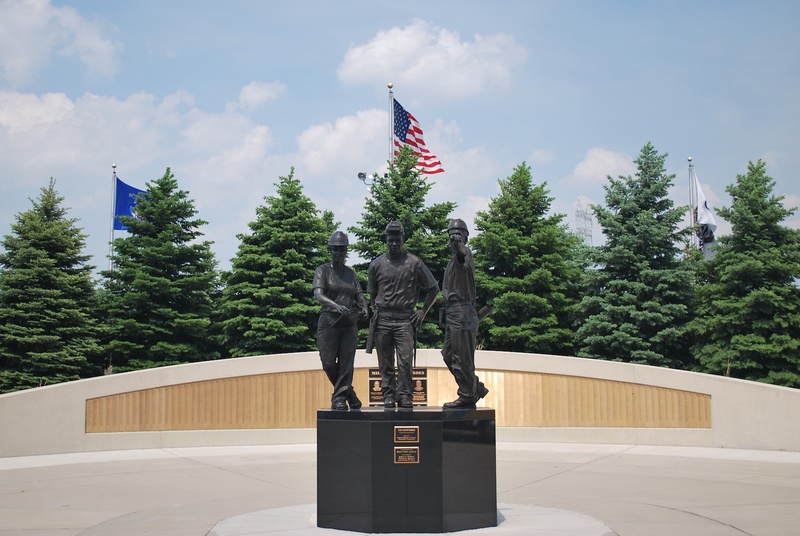 I think it’s commendable that the Brewers put the statue up, recognized what happened, and didn’t try to bury it in the past. Victoria and I were inside Miller Park by 12:15, and went over to section 238, where I started my progression back around the stadium in the loge level. After stopping saying hi to the Ice Man and Bill (the friendly vendor in 216) again, we made it to our seats in time for the national anthem. I got the BBQ brisket sandwich again, and was extremely disappointed with the amount of fat he included in my sandwich. I wish I would’ve taken a picture of all the fat I picked off the meat before eating it, it had to be at least 50-75 grams of fat. I know that I could probably use the extra weight, but I don’t want to do it by eating massive amounts of fat. The game started and I was thinking “here we go again”, after Greinke gave up two hits and a run in the top of the first. That sentiment quickly changed after the Brewers scored two runs in the first on solo home runs by Chart and Lucroy. It got even better as the Crew tacked on six runs on six hits in the bottom of the second. All the runs in the second came with two outs, and just like that the Brewers had an 8-1 lead. After the eighth run scored the Twins pulled the starter Marquis. The reliever who came in retired Izturis, who was responsible for 2 of the 3 outs in the inning. When Marquis was getting shelled I thought back to April 18th, 2010, when he was pitching for the Nationals. I was in D.C. for the Brewers-Nationals series, and Marquis didn’t retire a single batter, giving up 4 hits and 7 runs before being removed. Craig Counsell hit a grand slam later in the inning, and the Brewers wound up with 10 runs in the opening frame. Back to today’s game. The Brewers added two in the fourth, one in the fifth, then put a five-spot on the board in the seventh. Jonathan Lucroy hit a grand slam in the five-run seventh, and it capped an amazing day at the plate. His final line consisted of 3 hits (including 2 home runs), 3 runs scored, and SEVEN runs batted in, which ties a Brewers club record. The two outs of his were hard hit balls that could have easily fallen (one was a diving catch), and both would have driven in runs, which would have given him the outright Brewers single game RBI record. Looks like me posting the picture of him yesterday payed some dividends. You’re welcome LUUUUUUUUUUC!! It probably just looks like a guy pitching, but this was the Twins backup catcher (Drew Butera, pitching in the bottom of the eighth). For you non-baseball junkies, this happens from time to time. If a team is getting killed they’ll have a position player come in and pitch an inning to help save a taxed bullpen. Apparently they should’ve had Butera start the game, because he retired three of the four batters he faced, and got out of the inning without giving up a run. One of the three outs was a strikeout of Carlos Gomez, which of course was Butera’s first career strikeout as a pitcher. 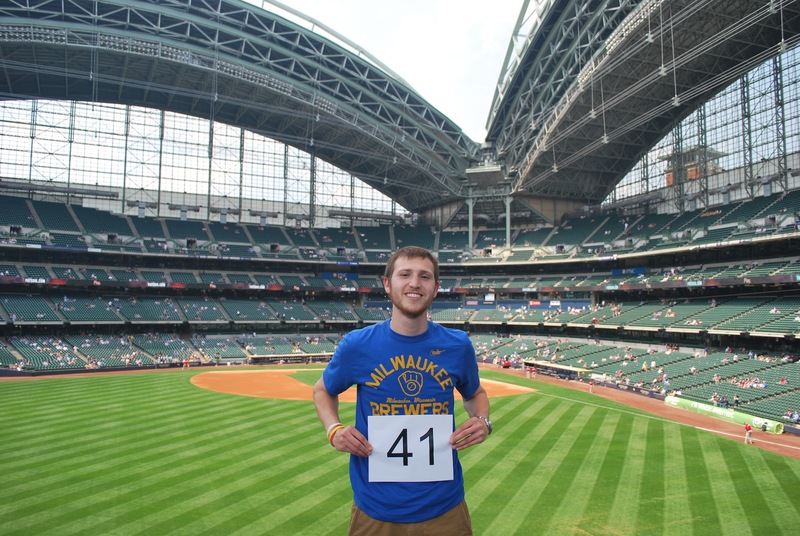 All around it was an entertaining day, and the Brewers needed the win. It’s unfortunate that it only counts as one win. Final Score: Brewers 16 – Twins 4. They outscored the Twins by three runs in the series, and yet lost two out of three games. One last picture, during the seventh inning the roof began to close, and I snapped a picture as the two sides were nearing. 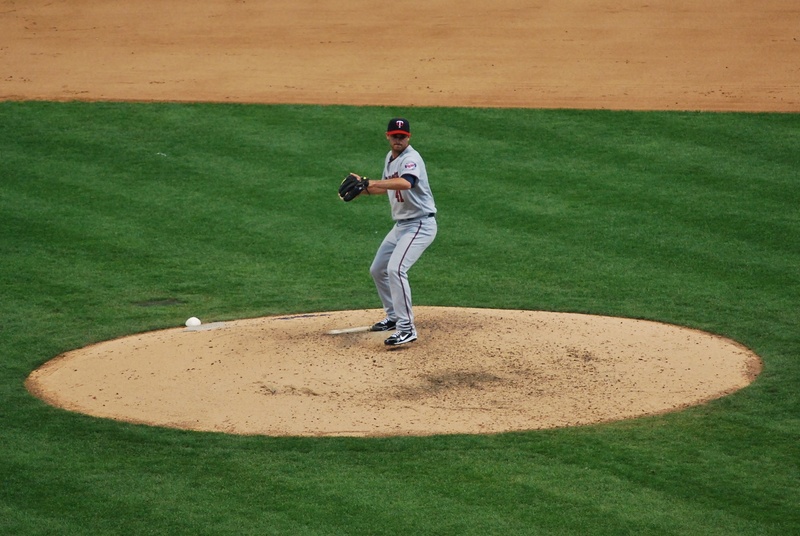 I think it’s always fun to watch, while pitches aren’t being thrown, of course. I did miss two pitches during the game, AGAIN! That’s back to back two-pitches-missed games; unforgivable! The first came in the fifth inning during Braun’s at bat (even more unforgivable). I was tweeting that the season had just past the quarter point of the season. Between the top and bottom of the fifth inning marked the 1/4 point (40.5 games out of 162). I also missed the 0-1 pitch to Trevor Plouffe in the top of the eighth, I was talking with Victoria about cameras, and got distracted. I will do my best to prevent these lapses in the future. Big series with the Giants starting tomorrow, and the Brewers face the tough Matt Cain on Tuesday, so it should be interesting. Speaking of Tuesday’s game. I’m assuming some readers don’t have twitter, or just aren’t following me @Brew_Mission162 yet, but I’m auctioning off a great seat for the game. The Doorman (the guy who sits right behind the opposing teams tunnel leading up to the clubhouse) gave me his two seats for the game, and I’m accepting bids for one of them. You’d be sitting next to me, and would likely be on TV a few times, since the broadcasts use the feed from the first base side cameras as right handed batters come to the plate. I’m donating all the proceeds to Be The Match, and I’m hoping we can make a decent-sized donation. The face value on the ticket is $100, but I have no idea what’s going to come of it. If you’re interested in the ticket, but don’t have a twitter account, just make a comment in this post with what you’d be willing to pay, and I’ll email you back if you’re the high bidder. I’m closing the bidding at noon on Tuesday afternoon.